Alberton is situated on the Albert River, about 30 km east of Corner Inlet at Wilson's Promontory, Gippsland. It was named after Prince Albert, Queen Victoria's consort. In 1841, after reports of good land, the Gipps Land Company was formed, sailing to Corner Inlet to inspect the area and applying for land on the east bank of the Albert River. This was known as Orr's Special Survey. In 1842 a site for a government township was surveyed and officially named Alberton. The next year another township, named Victoria, was set on the northern boundary of Alberton, on Orr's Survey. Alberton was not immediately settled, as towns were established at Port Albert, 7 km to the south, which became the port for the area, and at Tarraville, which was on the road from the port to the hinterland. By the 1880s the town had stagnated, but the promise of the coming railway boosted land sales. New houses, a new hotel, a mechanics' institute (1887) and a butter factory (1894) were built and Shire Offices were going to be built at Alberton. Alberton and Victoria were now officially one town. With the relocation of the municipal centre, businesses and services began to move to Yarram and Alberton declined. 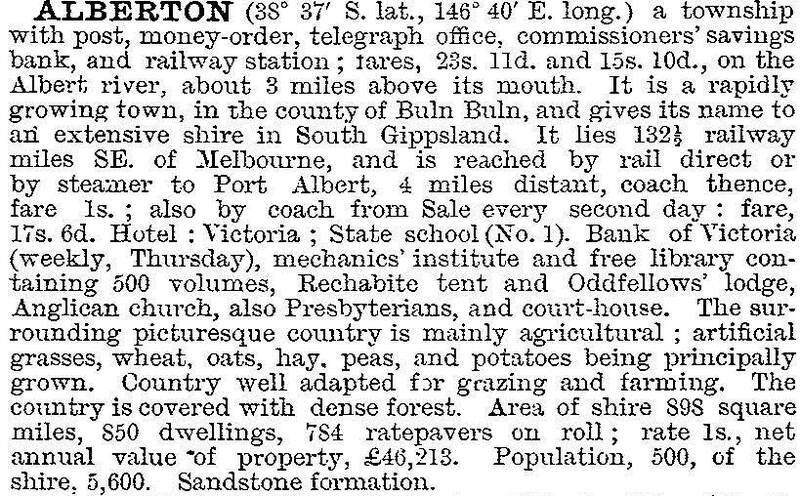 In 1921 the railway line was extended to Yarram, removing Alberton's importance as a railhead since 1892. The township was completely overtaken by Yarram, the commercial centre for the area, only five kilometres away. Cattle grazing became the main occupation and in 1994 there were 200 people resident in the district. The township is a straggle of buildings including the school and the second mechanics' institute (1932), but dominated by the Victoria Hotel. This large and formerly grand hotel was built in 1890 when Alberton was booming. The school at Alberton was designated No.1 because of its position in the alphabet when all schools were renumbered in 1872. As well there are a number of fairly old houses scattered around the town area and wider district, and the butter factory building remains. The Great Southern rail trail (the former railway line 1892-1987) is just north of the village. The school, with a catchment area extending to Port Albert and Tarraville, had an enrolment of 78 in 2011 and 69 in 2014.